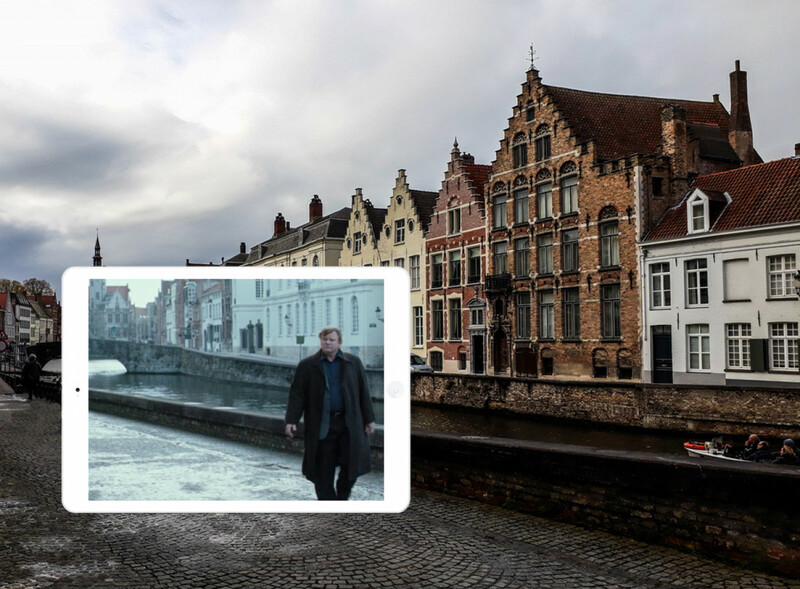 Back in 2008, the movie 'In Bruges' catapulted this already popular city to new heights. This seems surprising, given the fact that the storyline is rather dark. However, a quick web search revealed that scriptwriter Martin McDonagh had the idea for the story when spending a four day-long vacation in Bruges. No wonder the movie is essentially one big tourism advertisement. 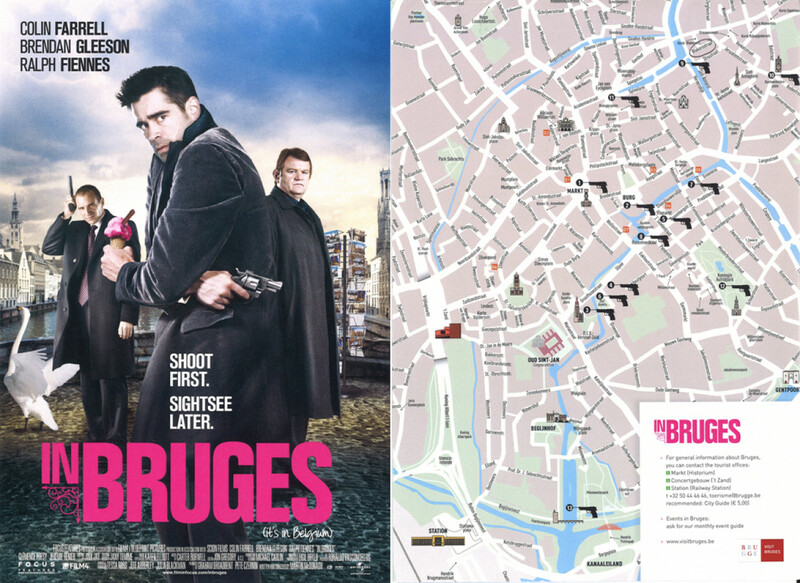 The city of Bruges has published a movie map, pointing out a number of locations from the film. Knowing from the outset that my time in Bruges would be limited, I emailed Ann Plovie from the city's press office. We agreed to meet in her office at 10am before setting off to scout the various locations around the inner city. The administration of Bruges was very supportive of the production and the evidence can still be seen in the press office. At the beginning of our tour, we passed by the brewery 'De Halve Maan' (Half Man). In a land renowned for its beer, the brewery's main point of difference is an underground pipeline that runs directly to the bottling plant just outside of the medieval part of Bruges! We strolled along the Minnewater (Lake of Love), a canal used as a port for the barges that frequented the waterways between Bruges and the city of Gent. The stone bridge over the canal is the location where we first see gangster boss Harry enter the city on his mission to kill Ray. The watchtower on the far end of the bridge was part of the old city defense perimeter. Walking back towards the inner city, we once again passed the picturesque Minnewater bridge. Swans are a common sight on the city's canals, for a good reason: Legend has it that the connection between Bruges and the majestic bird goes back to a decree put in place by Emperor Maximilian of Austria at the end of the 15th century. From here, we made our way to the Botanical Garden 'Astridpark' and the adjacent playground, both of which were used as locations: Ken has been tasked by his boss Harry to get rid of Ray. ...Ken approaches with the intention to find and kill his partner Ray. The fish market appears in a night scene: Harry chases Ray through the alleys to finish him off for good. Fresh fish is sold from Tuesday to Saturday. The Rozenhoedkaai is the most photographed spot and the starting point for the boat tours along the canals. The boat tours along the canals take about half an hour. The season runs from March to mid-November. Also on Rozenhoedkaai is the Relais Bourgondisch Cruyce - the city's most famous hotel (the building with the steep double gables). Ray and Ken used the hotel as their hideout, but when Ray finds out just how long he has to hide out for, he makes his feelings to Ken clear: ''For two weeks?! In f...ing Bruges?! In a room like this?! With you?! No way." Interesting: Actors Colin Farell and Brendan Gleeson actually stayed at Den Witten Leeuw, a gorgeous boutique bed & breakfast next to the brewery 'De Halve Maan'. Ken: "...And this morning and this afternoon we are doing whatever I want to do. Got it?" Ray: "Of course. Which I presume will involve culture." The central market square is dominated by the Belfry Tower. The building behind the flags is the Provincial Court. The square appears numerous times in the movie, for instance when Ken decides to go up the tower. He tries to convince his buddy to tag along, but to no avail. Ray: "The view of what? The view of down here? I can see that from down here." Ken: "Ray, you're about the worst tourist in the whole world." Ray: "Ken, I grew up in Dublin. I love Dublin. If I'd grown up on a farm, and was retarded, Bruges might impress me, but I didn't, so it doesn't." There are 366 stairs leading to the top of the tower and this photo was taken from only halfway up. ...Ray feels sorry for himself. Tourist to Ray: "Been to the top of the tower? The guidebook says it's a must-see." Ray: "Well, you lot ain't going up there." Tourist: "Pardon me? Why?" [...] Ray: "You're a bunch of f..ing elephants." Well, you lot ain't going up there. As the fuming family make their way to the tower entrance, Ken leaves the tower gatehouse. Ken: "Hey guys? I wouldn't go up there. It's really narrow and..." Woman: "Screw you, Motherf...". Later in the story, gangster boss Harry and Ken face each other on the top of Belfry. Only one of them returns. Back on the main square, the terrace of the restaurant De Beurze provided the right ambience for Ray's date with Chloe. Not far from the market square is the Bistro ‘t Zwart Huys where Ray and Ken enjoy their first Belgian beer. Jan Van Eyckplein square served as an inland port during the Middle Ages and features a statue of the famous Flemish painter Jan Van Eyck. Ray and Ken sit down on a bench in front of the statue, looking out towards the canal. Two killers philosophising about the afterlife. Ken walks along Spinolarei street, behind him is Jan Van Eyckplein square. From here, it's a 10 minute-walk to Jerusalem church. In the movie, the church stood in for the Basilica of the Holy Blood. Entry fees apply. No trip to Bruges is complete without a visit to the Groeninge Museum. The building houses a substantial selection of 15th to 20th century paintings, including a number of masterpieces from the Flemish artists Jan van Eyck and Hans Memling. Entry fees apply. The painting on the left is Hieronymus Bosch's 'Last Judgement'. Ken in front of Jan Provost's work 'Death and the Miser' (1500). As much as I loved my day of scene hunting in Bruges, one aspect of my visit was very disappointing: I really wished I had stayed longer. Ann did a great job hosting me on this whirlwind tour, so thank you Ann! We'll definitely be back to check out the locations from BBC's TV show The White Queen. If you need some additional guidance to visit the film locations from the movie 'In Bruges', you can download an official film location map. Like Ray and Ken, book into historic Relais Bourgondisch Cruyce. Or if you want to stay where actors Colin Farell and Brendan Gleeson had their rooms during filming, opt for Den Witten Leeuw, a boutique bed & breakfast next to the brewery 'De Halve Maan'.